In a blender, add the fresh berries, unsweetened almond milk, yogurt and chia seeds; blend until smooth. 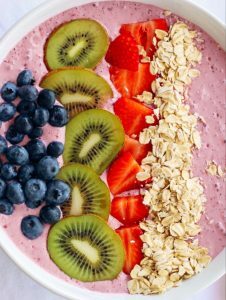 Pour the smoothie into a bowl. Top with fresh or dried fruit, nuts, granola and/or seeds.